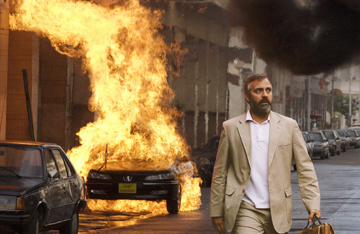 Syriana\r\nStarring George Clooney, Alexander Siddig, Mazhar Munir, and Matt Damon. Written and directed by Stephen Gaghan, based on Robert Baer�s memoir. Rated R.
It isn�t the warmest, but the socially conscious Syriana is still Syriously good. The movie doesn�t tell you, so I will: The title of Syriana refers to an idea in certain Washington policy-making circles that American intervention might somehow turn the troublesome countries of Iran, Iraq, and Syria into a region of U.S.-friendly nations that will compliantly hand over their oil reserves at reasonable prices. Of course, this is only a pipe dream, and Syriana sees that quite clearly. Intelligent, socially conscious, and sturdily constructed, the film exposes the incredibly complicated workings of an industry that few Westerners can live without, set in a part of the world bubbling with religious and political strife. The movie imparts a great deal of information, resists easy answers and tidy resolutions, and yet still has the tension and punch of a Hollywood thriller. Writer-director Stephen Gaghan made his name penning the script for Steven Soderbergh�s Traffic before debuting as a director with the intriguing though failed 2002 supernatural thriller Abandon. His current film is inspired by the book See No Evil, an account by former CIA agent Robert Baer of his 15 years of fieldwork in the Middle East, though the movie bears little resemblance to Baer�s policy tome. Like Traffic, this film features a far-flung plot that reaches across the globe. The most interesting plotline takes place in an unnamed Persian Gulf country where Bryan Woodman (Matt Damon), an American analyst for a Swiss company trading in energy stocks, is trying to advance a business proposal to the ailing head of the royal family. Bryan�s efforts go nowhere until his young son dies in the emir�s swimming pool during a party. As a token of condolence, the emir�s son, Prince Nasir (Sudanese actor Alexander Siddig), offers him a deal worth $75 million. Bryan responds by asking, �How much would you give me for my other kid?� before launching into a rant about how corrupt and socially backward the oil-rich Arab countries are. His uncharacteristic burst of candor wins over the Western-educated prince, who wants democracy and sweeping social reform for his nation. Unfortunately, Prince Nasir�s vision includes maximizing profits by sending his oil to Europe and China instead of America, and that�s enough to put his name on a CIA hit list. Other major players here are a CIA agent (George Clooney, packing some extra pounds) trying to arrange the hit, an unassuming D.C. lawyer (Jeffrey Wright) playing Machiavellian power games to get an oil-company merger approved by the U.S. Justice Department, and a Pakistani oil-field worker (Mazhar Munir) who becomes a suicide bomber after losing his job and being mistreated by the Arab country where he used to work. There�s enough story material to fill a three-hour movie, and remarkably, it�s all crammed into just over two hours. The film isn�t seamless � a splenetic monologue about the benefits of corruption delivered by a jail-bound Texas oilman (Tim Blake Nelson) erupts out of nowhere. Still, Gaghan deftly juggles his storylines and shows the connections among country-club lawyers in Houston, machine-gun-toting Hezbollah thugs in Beirut, and a cadre of Arabic-speaking Chinese businessmen. With all this, the movie could have been a masterpiece had it provided any sort of a catharsis. None of the characters has enough traction to qualify as a tragic hero, and none of the actors can give his role the proper weight, though Siddig comes close. You leave the theater considerably enlightened but unmoved on any deeper level. Brilliant and commendable as it is, Syriana is about as warm as a policy brief. Yet admittedly, it�s a lot more compelling.